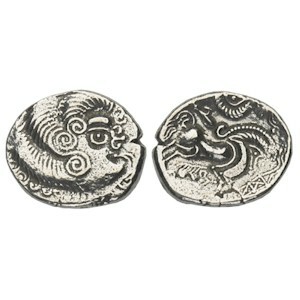 Obverse: Celtic designed head facing right, with anchor shaped nose. Reverse: Horse galloping right with boar below, remains of driver with Victory above. History: This coin was made in the Channel Islands and imported into the south-east of England. Date: Class III, Circa 75 - 50 BC.